Senturus has developed two programs to help mitigate these common BI issues and improve your system. Both plans are risk-free and fully guaranteed: with each, we'll reveal a way to significantly improve your BI environment, or we'll give you your money back. This program provides the most comprehensive review across the entire BI stack components, including Presentation Layer, Data Warehouse Layer, Transformation Layer, Server and Application Layer and BI Tools Layer. Once assessed, Senturus will provide a grade in each of these areas to highlight where your system stands against industry best practices. We’ll also share concrete findings along with a recommended roadmap for each stack component, prioritized to provide quick wins related to improving your BI platform. 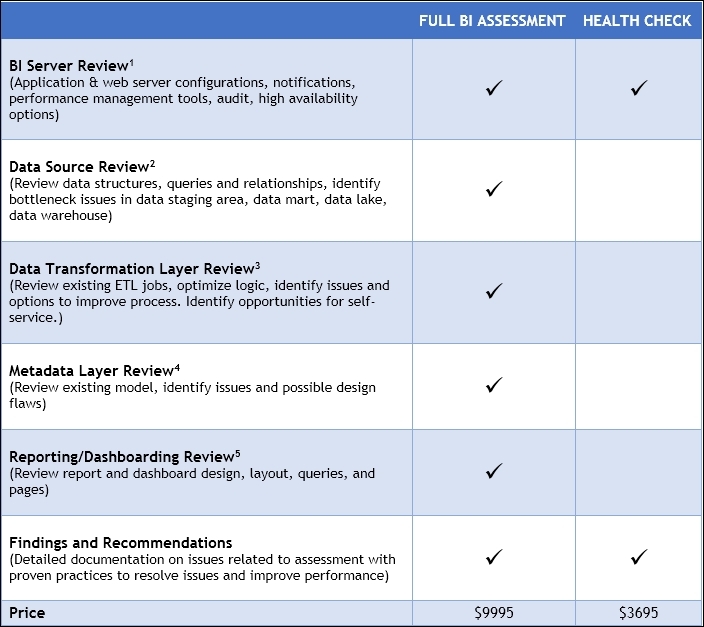 Similar to the benefits of conducting routine car maintenance, our Cognos BI Health Check is intended to help identify potential trouble spots in your BI system, before they become bigger (not to mention more complicated and expensive) issues. Performing a Health Check on your BI environment will help keep your system running smoothly, while minimizing down time for your end users. For more information on our upgrade support programs or if you would like to schedule a complimentary one-hour consultation, a representative can contact you directly, or you can contact us at 1 888 601 6010 ext. 87 or info@senturus.com. Again, if we don’t provide you with information that reveals a significant insight on how to improve your BI environment, we offer a money back guarantee with both programs.